"Wine Spectator" has rated the wine "Cantina Terlano-Kellerei Terlan Gries Lagrein Alto Adige Riserva, Trentino-Alto Adige, Italy" the vintage 2012 on 29.02.2016 with 90 of 100 points. "Falstaff Magazin" has rated the wine "Cantina Terlano-Kellerei Terlan Gries Lagrein Alto Adige Riserva, Trentino-Alto Adige, Italy" the vintage 2009 on 12.10.2012 with 90 of 100 points. "Wine & Spirits Magazine" has rated the wine "Cantina Terlano-Kellerei Terlan Gries Lagrein Alto Adige Riserva, Trentino-Alto Adige, Italy" the vintage 2008 on 01.08.2012 with 92 of 100 points. "Wine Spectator" has rated the wine "Cantina Terlano-Kellerei Terlan Gries Lagrein Alto Adige Riserva, Trentino-Alto Adige, Italy" the vintage 2008 on 15.10.2011 with 93 of 100 points. "Vinum Wine Magazine" has rated the wine "Cantina Terlano-Kellerei Terlan Gries Lagrein Alto Adige Riserva, Trentino-Alto Adige, Italy" the vintage 2008 on 01.05.2011 with 15 of 20 points. "Vinous Antonio Galloni" has rated the wine "Cantina Terlano-Kellerei Terlan Gries Lagrein Alto Adige Riserva, Trentino-Alto Adige, Italy" the vintage 2006 on 01.10.2009 with 87 of 100 points. "Wine Enthusiast" has rated the wine "Cantina Terlano-Kellerei Terlan Gries Lagrein Alto Adige Riserva, Trentino-Alto Adige, Italy" the vintage 2004 on 05.01.2009 with 88 of 100 points. "Wine & Spirits Magazine" has rated the wine "Cantina Terlano-Kellerei Terlan Gries Lagrein Alto Adige Riserva, Trentino-Alto Adige, Italy" the vintage 2004 on 01.06.2008 with 92 of 100 points. "Wine Spectator" has rated the wine "Cantina Terlano-Kellerei Terlan Gries Lagrein Alto Adige Riserva, Trentino-Alto Adige, Italy" the vintage 2003 on 30.06.2007 with 90 of 100 points. "Vinum Wine Magazine" has rated the wine "Cantina Terlano-Kellerei Terlan Gries Lagrein Alto Adige Riserva, Trentino-Alto Adige, Italy" the vintage 2002 on 01.04.2006 with 15 of 20 points. "Vinum Wine Magazine" has rated the wine "Cantina Terlano-Kellerei Terlan Gries Lagrein Alto Adige Riserva, Trentino-Alto Adige, Italy" the vintage 2000 on 01.03.2004 with 15 of 20 points. "Wine & Spirits Magazine" has rated the wine "Cantina Terlano-Kellerei Terlan Gries Lagrein Alto Adige Riserva, Trentino-Alto Adige, Italy" the vintage 1999 on 01.10.2002 with 88 of 100 points. "Stephen Tanzer" has rated the wine "Cantina Terlano-Kellerei Terlan Gries Lagrein Alto Adige Riserva, Trentino-Alto Adige, Italy" the vintage 2000 with 92 of 100 points. "CellarTracker" has rated the wine "Cantina Terlano-Kellerei Terlan Gries Lagrein Alto Adige Riserva, Trentino-Alto Adige, Italy" the vintage 2010 with 89 of 100 points. "CellarTracker" has rated the wine "Cantina Terlano-Kellerei Terlan Gries Lagrein Alto Adige Riserva, Trentino-Alto Adige, Italy" the vintage 2012 with 87 of 100 points. "CellarTracker" has rated the wine "Cantina Terlano-Kellerei Terlan Gries Lagrein Alto Adige Riserva, Trentino-Alto Adige, Italy" the vintage 2007 with 86 of 100 points. 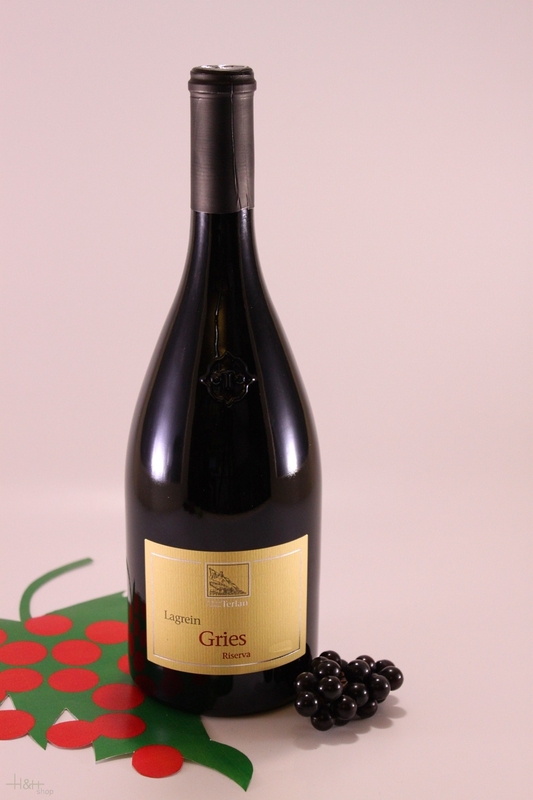 The ideal location of our Gries Lagrein Riserva in the historical vineyard of Gries, in Bozen, arouses its fruity and savory aromas of ripe fruit, cherry and chocolate. The heat of Bozen's circular valley lends it velvety elegance, a soft body and vivid freshness, with well-integrated tannins. 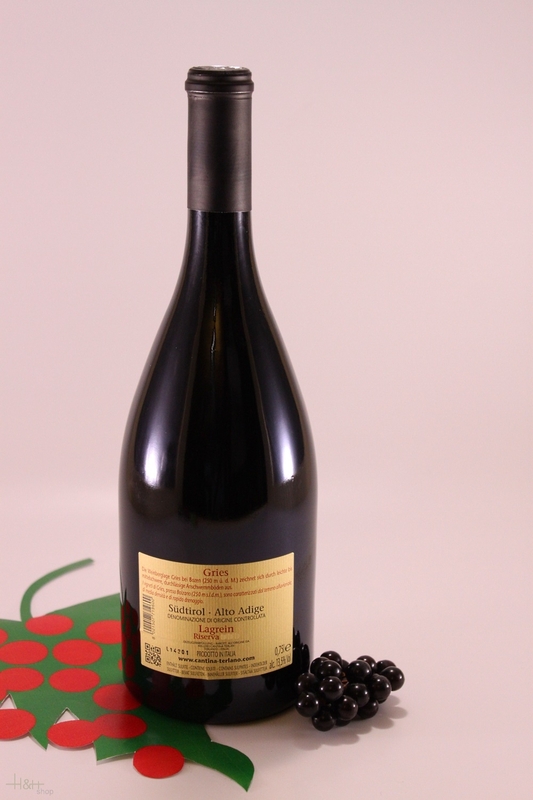 With its fruity finish, it is the perfect partner for lamb, game and red, grilled meats. medium cherry-red colour. Pronounced, fruity (prune, cherry) and spicy aroma with notes of leather, tar, dark chocolate and floral nuances (violets), along with oak spice. Medium structure and with good fruit intensity on the palate. The tannins are present though balanced. Good length with an earthy aftertaste. When cellared under proper conditions, this wine may be kept for 8 to 10 years.